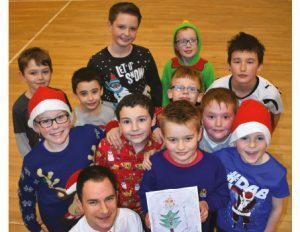 A member of 2nd Polmont Junior Section has been announced as the winner of the 2017 BB Scotland Christmas Design Competition. The design by Moray Stuart (10) was used as the image for The Boys’ Brigade Scottish Headquarters’ Christmas card and e-cards this year. Moray was presented his prizes by Niall Rolland, Communications & Engagement Officer, on Friday 8th December. He received an art set and digital camera for coming up with the winning design. Moray’s design beat off competition from entries from 30 other BB companies across Scotland. Some of the entries, including Moray’s, were featured as part of the #myBBadvent social media advent calendar. Thank you to all the Companies who participated.